We acquire our pets from all sorts of places - some come from friends, some from pet stores, some from breeders, and some find us. We found Leonard in March 1996, left for us in a paper bag in the clinic restroom. At the time he was malnourished and had a fractured hind leg. We nursed Leonard back to health, syringe feeding him until he would eat on his own, and placed a cast to try to get his fracture to heal. Over the next several months Leonard gained strength; monthly follow up x-rays showed that his leg was indeed healing. And he grew ... and grew ... and grew. Leonard weighed less than 2 pounds when we found him. When full grown he was over 11 lb. and measured 52 inches from head to toe. His cast needed to be changed several times because he kept outgrowing it. Leonard lived at the clinic for more than 10 years. Initially he was kept in a 50 gallon tank, but soon outgrew that. For several years after he occupied a space set aside on the top of the bookshelves in the Drs.' Office. For the last few years he has lived in a specially designed reptile enclosure that was most suited to his special temperature and ultraviolet light needs. Leonard did have the opportunity to stretch his legs on occasion. He especially liked basking in the sun in the front vestibule. He would also occasionally chase the staff if they entered "his" domain; we were never totally sure if his intentions were to protect his territory or of a more amorous nature. Leonard also loved having his neck and shoulders scratched, usually closing his eyes and stretching his neck out with a blissful look on his face. Alas, none of us lives forever, not even our reptiles. We noticed that Leonard had been slowing down recently, and his appetite decreased significantly. Blood work showed that he was suffering from chronic kidney disease, from which he succumbed on <?xml:namespace prefix = st1 ns = "urn:schemas-microsoft-com:office:smarttags" />February 1, 2007. 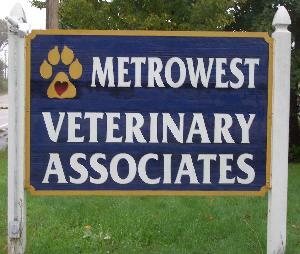 Leonard was a fixture at Metrowest Veterinary Associates for many years. He has kept a watchful eye as our clinic has grown. He will be missed, and he will be remembered.